We’ve got pretty widespread recycling across Europe these days – people generally “get it” and put their recycling out. There’s still a lot of work to do to get recyclables in, but, broadly, we know what to do. San Francisco recently celebrated diversion of 92% of their waste from landfills. Recycling is great, but it can be done in loads of ways – paper, glass, plastics, and metal recycling have their place, but they have problems, too. WEEE is a big problem – waste electronics, many of which end up in landfills – are full of refined precious metals often in much higher concentrations than the ore they were originally extracted from. Computers, mobile phones, chargers, tablets, VCRs, DVD players – these work on a particular cycle – people upgrade, and chuck the old one out. Further, when it breaks, there are whole chipsets that are still useful – usually one chip or even a motor is the only thing that’s broken. We hold up aluminium cans as the gold standard of recycling: easy, cheap, saves energy, profitable. But did you know that there are 2 different grades of aluminium in a can? You can’t melt one down and create another – the top and the sides are different types of aluminium. They end up being recycled into a different product, one that has looser materials properties – maybe a stud for wallboard. Then, when that’s recycled it gets more impurities. The same thing happens with the 50 billion plastic bottles used only in America (which, you’ll notice, have different types of plastic for tops and bottoms). They can be remanufactured into carpets, fleece, park benches… but not more plastic bottles. That’s not currently recycled, reused, or dealt with properly, for a massive variety of products. There are behaviour issues – getting people to actually recycle certain things. There’s a question of the markets for recycled goods. So what to do about all this? The BGV community – now and in future – is filled with people with great ideas that just might change the world. 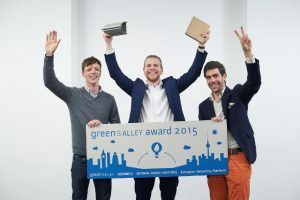 It’s not just us and Green Alley – the partnership includes Landbell Group, the group that manages the European Recycling Platform – and Seedmatch – Germany’s largest equity crowdfunding platform. 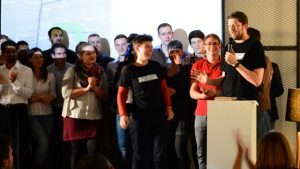 Those selected will go on to a full-day workshop in November, and one winner will get €20,000 in cash and in-kind services – including €7,000 and 6 months’ office space in Berlin. 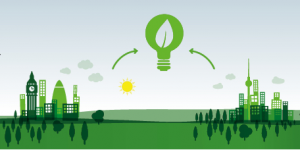 The real prize is the network – if you’re working on reuse and recycling platforms, the networks will be invaluable to you. Apply here – and hopefully we’ll see you in Berlin in November.